WHAT WOULD YOU DO IF YOUR PET NEEDED YOU TO SAVE HIS LIFE? LEARN HANDS-ON TECHNIQUES TO HELP YOUR PET IN AN EMERGENCY! Rebeccah Kleinberg is a Certified First Aid & CPR Instructor offering Pet First Aid & CPR Certification Training at What An Obedient Dog! in Carrollton. Pet First Aid is the immediate care given to a pet that has been injured, and Pet CPR a technique given to a pet that has been found unconscious. Knowing this skills can help avoid expensive emergency veterinarian bills. Your pet will love you for it too! The skills and techniques of Pet First Aid, CPR are best learned through lecture, demonstration and hands-on skill practice. REGISTRATION BELOW - LIMITED SPACE - SIGN UP TODAY!! OUR REAL LIVE DEMO DOGS! Thank you for signing up for the Pet CPR and First Aid Workshop. Two weeks before the workshop starts, we will send you an email confirming your attendance. HAPPINESS is knowing you can help save the life of your dog or cat in an emergency!! 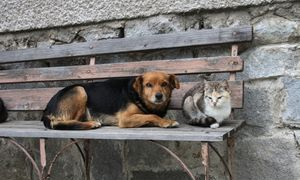 According to the American Animal Hospital Association (AAHA), one-out-of-four pets would survive if just one pet first aid technique was applied prior to getting emergency veterinary care. Be prepared to provide the best possible care for your pets. They will LOVE you for it! The cost of knowing how to either PREVENT that emergency from ever happening or knowing how to save your dog or cat when they need you most...PRICELESS!